It is important while navigating ship the officer of the watch understands practical procedures to avoid collision guided by masters standing orders. These procedures are only indicative, not exhaustive in nature and one must always be guided by practices of good seamanship.Call attention of other ships that are in adjacent waters by turning on deck lights, putting up the lights or shaped objects to show not under command, using VHF, and other possible means. Upon collision with another ship, Go Astern as early as possible to limit the damage and to avoid further contact. But if the bow of the vessel has penetrated into the side shell of the other vessel, reverse the engine only after an initial damage assessment as one of the vessels may suddenly lose her buoyancy and sink, or cause/increase oil pollution. Survey the degree of damages of the hull by sounding all compartments likely to be affected by the collision. Limit any flooding by using available means onboard. (1)	If the leakage is small, wooden plugs, blankets, tarpaulin, cement boxes or the like can be used to reduce the flooding rate. (2)	An increase in draft due to flooding can cause flooding through openings that are usually above waterlines, to which serious attention must be given. (3)	If high rate flooding is likely to cause the vessel to sink, an intentional stranding should be considered. (4)	In case of a leakage in the fore peak tank, proceed with reduced speed so that excessive pressure on the collision bulkhead is kept to a minimum, and move the vessel to safer waters . Ballast aft tanks if possible to regain freeboard forward. Follow the Companys instructions to conclude a salvage contract, for which communication must be established between the Company and the vessel as soon as possible after the accident. When there is imminent danger, where is absolutely no time to wait for the Companys decision, however, the Master may request salvage using his professional judgment. In this case, the Master must confirm that the contract is based on the Lloyds Open Form (LOF) even at the worst case, and Avoid having salvers start the operation without confirming the conditions of the contract. If danger is imminent to human lives onboard the vessel, every effort should be done to evacuate everyone from the vessel. The Master shall request the salvage by all available means prior to the evacuation to show that the vessel side has no intention to abandon the hull and cargo. (1)	If there is no urgent danger to the vessel, stay near the other ship to take all necessary measures to save human lives and assist in possible rescue attempt of the other vessel. (2)	If the other vessel has sunk or is likely to sink, do the very best to save human lives immediately by lowering lifeboats or other possible means. (3)	If it is unavoidable to discontinue the search although there are still persons reported lost from the other ship, obtain consent of the other ship or the Rescue Coordination Centre. Enter the fact in the deck logbook. If the accident is likely to cause obstruction to marine traffic, the Master shall report the matter to the nearest office of the Maritime Safety Agency while in Japanese territorial waters, or the Coast Guard or the like, if the vessel is in territorial waters of countries other than Japan. Although an error through negligence for an accident is decided by a trial or a marine accidental inquiry, be sure to submit a claim letter to the other ship regardless of the causes of the accident, and request the Master of the other ship to sign the letter. The claim letter should be sent swiftly by any available route including if necessary electronic means. If the other ship sends the claim letter to the vessel, never insert or accept a wording that may be interpreted as admission of liability. If it is unavoidable to sign the claim letter from the other ship, sign the document affixing the following remark, I received your claim notice without prejudice or This is not an admission of liability or similar wording. The Master shall investigate the event by interviewing all persons concerned and try to establish all facts leading up to the event. The Master should convene a meeting to collect all types of information from crew members to grasp the fact of the collision which should be consistent with the evidential records/documents on board. Time records of course recorder. Time records of telegraph logger. The Master shall make records after investigation of the above and prepare extracts of the respective log books. The Master shall try to obtain the signed statement or testimony about the accident from third parties, such as pilot and other persons who were onboard or near the vessel when the accident occurred, if it is possible and the Master deems it advantageous to the Company. Various persons concerned, such as the officer of competent authorities, surveyors, lawyers and underwriters, visit the vessel to probe conditions of the collision. In such cases, the Master shall give the gangway strict instructions not to permit access to anybody until specifically authorized by him to do so. The Master shall not admit any person except competent authorities or persons permitted by the Company. If there is doubt a visitors authorization to board the vessel, the Company shall be contacted before access is granted. When any crew member is questioned about the accident by competent authorities in a port outside Japan, The Master shall request the presence of a lawyer representing the Company and an interpreter if possible. Such representatives will be arranged by the Company. In order to allow the required time for the necessary arrangements, the Master must inform the Company as early as possible after it is known that such an inquiry will be made. For an accident related to P&I matters, a local P&I representative shall be arranged. The Master shall not permit interviews by a lawyer or surveyor nominated by the opposing vessel without permission of the Company. When such lawyers and surveyors visit the vessel directly, decline interviews with them, saying as everything is left to the lawyer nominated by the vessel, please discuss with him. Even when instructions for an interview are given from the Company, due care shall be taken not to give statements which may be unfavorable to the vessel or the Company. Such interviews shall be limited to the Master and Officer of the Watch only. Especially, logbook and records should by no means be shown to a lawyer or surveyor nominated by the opposing vessel. To write the Plain Fact and to mention points favorable to vessel in detail. Each Officer of the watch shall make entry in his own handwriting. To write the Fact briefly. Details of the development of the event are not necessary. Not to write definite time and place, but enter approximate time and place only. Cause and detailed condition of the collision should not be entered but write matters which are positive and favorable to the vessel. 1. Temporary repairs by the crew or, if required, with assistance from external Sources. 2. Requirements for inspection by Class. 5. Arrangement of salvage (Towing). The Master shall survey the extent of damage conditions as detailed as possible to judge whether there are any obstructions to continued navigation, and report immediately to the Company. The vessel shall follow instructions given by local authorities. If SOLAS-related equipment (Life-saving equipment, such as Lifeboats in particular) is damaged, inform the Company immediately. The vessel shall not leave a port until the damaged equipment is repaired by an authorized person or replaced. (1)	The Company will arrange surveys [Class survey, Damage survey, Joint (WP) survey with the opponent party, and P&I representatives] as required after consultation with the Insurance company. (2)	Where the vessel is in a foreign port, the Company will arrange necessary surveys, divers and others through local representatives or agent. (3)	In case of an independent accident of the vessel only, for example, a collision with a floating object on the high seas which causes or is likely to cause deformation of shell plating or similar damages, the Master must survey the hull as carefully as possible and report to the Company as soon as possible. The Company will discuss the situation with the Classification Society in question and discuss the further handling of the situation. (4)	In case of an accident involving liability problems between the opposing parties, for example, a collision accident with another ship, the degree and extent of damage of each ship must be confirmed, which generally requires surveys by fair and neutral organizations. (5)	Deal with any surveyors coming onboard as per Article 11 Dealing with Visitors above. When the vessel enters a port after a collision, a Seaworthiness Certificate, if required must be obtained from the classification society before departure. try to have the surveyor revise the expression on the certificate to The damage to be re-surveyed upon arrival in XXXX (or in a port on the way to XXXX) for recommendation of necessary repairs as the first port in Japan may not always have sufficient capability for the required repairs. In any case, the Master must immediately send a copy of the certificate to the Company. 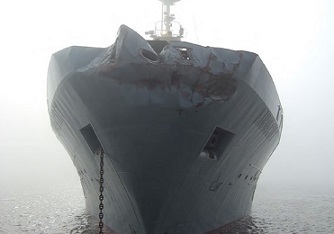 As a general guidance, the seaworthiness is lost by a damage opening the hull, dented or buckled inner strength members, or a dent on the hull 50 mm or more in depth.